Monta Ramen House, Las Vegas – Sweet Merciful Ramen! A night of over consumption in Las Vegas had us in search of hangover food the next day. Vietnamese Pho is usually a good fixer-upper but lately I’ve been curious about ramen, a soup dish that has become hugely popular across North America. 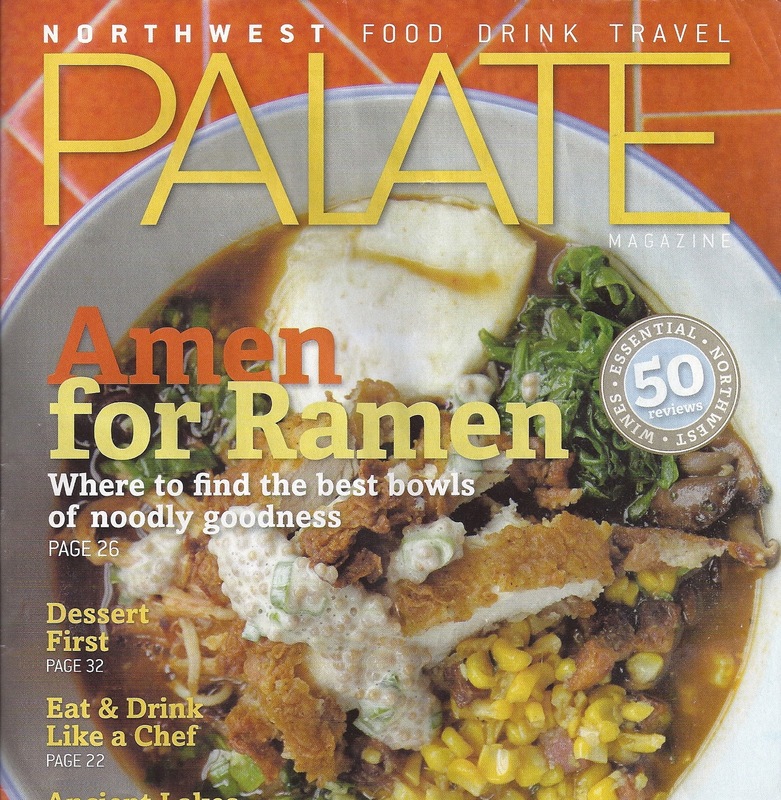 In fact, I had just finished reading Jay Friedman’s article in the Nov/Dec 2011 issue of Northwest Palate so we were thrilled to find Monta, Sin City’s top rated ramen house. Ramen, said to have originated in China but adopted and adapted by the Japanese, is what people seek when they want umami-packed Asian soul food. At 11:40 a.m. the place was packed. We grabbed the two remaining seats at the counter, right next to a fellow from California who drove over four hours for Monta’s ramen. This man, who has traveled all over the world, said Monta’s ramen is the next best thing to what he experienced in Japan. Still, we had no idea what to expect. We didn’t expect heaven in a bowl—which is pretty much what we got, and exactly what we needed after a night of dallying with several of the seven deadly sins. Monta serves ramen (wheat flour noodles) in four broth styles: Shoyu (soy sauce), Miso (bean paste), Tonkostsu (pork bone) and Tonkotsu-Shoyu (combination of pork bone broth and soy sauce). The pork broth is made by boiling pork bones, fat, and collagen over high heat for many hours until all that remains is a cloudy, viscous, deeply layered broth. All of Monta’s ramen soups come with green onions, two slices of chashu, bamboo shoots and kikurage (mushroom). You can choose to add more toppings like nitamago (soft boiled egg) which adds more silkiness to the hearty soup. I would highly recommend ordering extra chashu, a thin slice of pork with a noticeable fat strip that makes the pork literally melt on your tongue. Have you ever eaten something so good it almost makes you weep? This is ramen. And when ramen is this good, it’s not just food, it’s an otherworldly experience. In two weeks we’re going to Portland which, along with Los Angeles and New York, is apparently, a ramen hotbed and thanks to that article in Northwest Palate, I know exactly where we’ll be headed: Shigezo, Biwa, Yuzu, Wafu and maybe even Boke Bowl for that southern-fried chicken ramen. Five days, five ramen restaurants. Entirely do-able. sounds delish Twyla — makes me want to jet off to Vegas but instead I think I’ll look for one of these spots in Seattle. did you get to hear Andrea Bocelli like you were planning and was he fabulous? Hi Twyla! I love Ramen!! Great post – made my mouth water! There’s a really good mag that started in 2011 called Lucky Peach and the first edition was dedicated entirely to Ramen. It’s really esoteric – so many different kinds, all of which I want to try! I’d love to get my hands on that issue…seems to be hard to get though. And yes, ramen: wow…I’m craving it & wish I would’ve gone back a second time while we were in Vegas. Guess I’ll just have to get my fill in Portland. Andrea Bocelli was amazing (of course). He came back for about 5 encores. But the standout performance(s) of the night came from a singer named Heather Headley who absolutely blew away the 14,000 concert goers. She has the voice of an angel and the power of a freight train. Imagine Celine Dion, Aretha Franklin and Mariah Carey combined. When she sang Vivo Per Lei with Bocelli, I had to fight back the tears. It was incredible. I’d go out of my way to see her again.